How Oregon Wagon and Wheel came to be. I've been surrounded by or lost in the woods most of my life. Michigan with its maple, red oak, white birch and pines. Colorado, its blue spruce and aspen. Oregon, its Douglas fir and white oak. My seventh grade woodshop teacher was particularly understanding the afternoon the bowl I was turning got a little thin and went into orbit. It was maple. Forty years later, my woodworking experience includes: general carpentry, toymaking, boatbuilding and barrel-stave production. I started Oregon Wagon and Wheel to add wainwright to the list. While researching gypsy caravans, I came to the sheepherder wagon, or sheepcamp as it's called in this part of the West. This home on wheels was used by sheepherders as they followed their flocks across the grasslands and mountains. 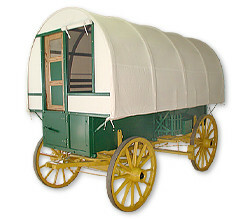 For a little more about sheepherder wagons, take a look in the History section. Historically accurate and carefully crafted! The Oregon Komfort Wagon is an historically accurate replica of a commercially available turn-of-the-century sheepcamp. In fact, the pattern we use is still owned by the family that purchased it new in 1910. As you will see, the OK Wagon is constructed of premium materials, carefully crafted using traditional joinery techniques and hand-forged metalwork. While there is no "standard" sheepcamp, they all are remarkably similar in form and function. The refinements embodied in the OK Wagon are the result of 25 years of development between 1885 and 1910.